Black Ice Software - BiLPDManager version 2.07 is released! BiLPDManager version 2.07 is released! New features to minimize BiLPDManager User Interface, and to start BiLPDManager automatically when Windows starts! Black Ice Software has released version 2.07 of the BiLPDManager. This version includes new features to minimize the BiLPDManager User Interface, to let users to process and print out the incoming print jobs automatically in the background. 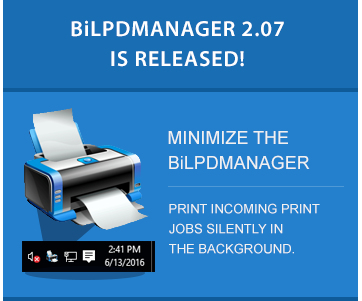 The latest release of BiLPDManager version 2.07 also includes improvements to start the BiLPDManager User Interface minimized automatically, when the Windows starts up, allowing users and administrators to run the BiLPDManager in the background, and to print the incoming print jobs silently, without any user interaction.